Glassware. Shot glasses absolutely have their time and place (just get rid of the tacky ones), but most nights will probably not be spent celebrating at top speed. Give your bourbon an honest home with two main sizes: large and small. Highball glasses are for mixed drinks and should hold about 12 ounces. The smaller, 8-ounce rocks glasses are ideal for drinking Ezra Brooks neat or over ice. It’s also the glass that several classic cocktails, including the old fashioned, are served in. Shaker and strainer. James Bond preferred his drinks shaken, not stirred, and plenty of cocktail recipes call for the same. Shakers combine ingredients into a smooth finished product, and adding ice chills the liquid faster and produces a satisfyingly frosty outcome. Use the strainer to stop rogue cubes when you’re pouring the final product. Stirrer. A tall bar spoon will work when you’re mixing up a pitcher of cocktails, and it doubles as a measurement tool, as it equals about a teaspoon. However, the truly suave keep smaller stainless steel or decorative stirrers on hand. These allow your guests to continually freshen their whiskey drinks as the ice melts. They also make stylish accessories. Muddler. Like the name implies, this handy little tool is used when a drink calls for something muddled, such as mint in a mint julep, or bitters and sugar in an old fashioned. A muddler in your cocktail-making arsenal shows your serious. Jigger. Sure, you can use one of those college-era shot glasses to measure the whiskey for your cocktail. 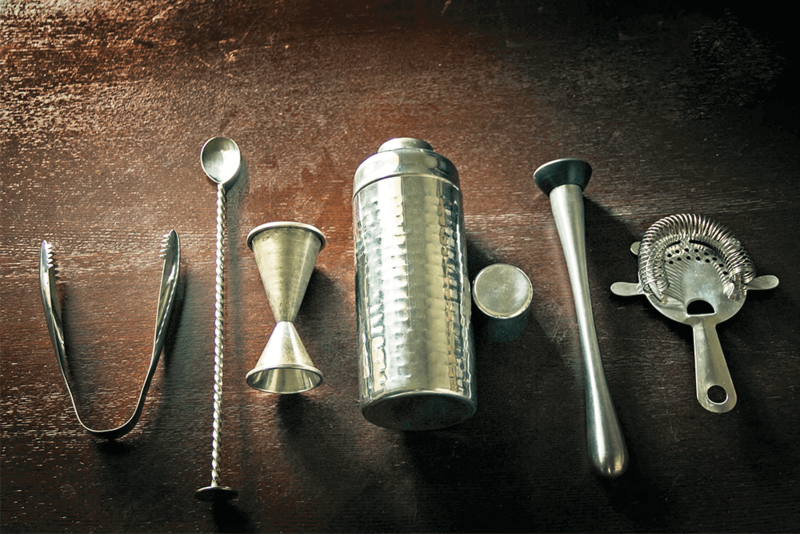 But using a stainless steel jigger is classier — and more precise. When you’re mixing up the perfect Manhattan, exact measurements matter. Mixing glass. You need one of these if the cocktail recipe calls for mixing the ingredients in a glass and stirring with ice. Although you could reach for the closest pint glass, a mixing glass is preferred — not only because it looks better in front of an audience, but also because it has purpose. It has a wide base so you can quickly stir your cocktail without fear of it tipping over. And it has a wider mouth with a pour spout, making it that much easier to pour into your drinking glass. Form and function. Ice bucket. Just as nothing ruins the mood faster than listening to the freezer churn out some ice cubes, a fancy ice bucket atop your bar telegraphs being put-together. Don’t forget miniature tongs or a small ice scoop for easy retrieval. Cocktail napkins and coasters. Eventually your cocktail creations will leave their bar home, so give them a nice place to land. Take pride in your home’s surfaces by protecting them, and take the pressure off your guests by providing them with everything they need to enjoy their drinks in comfort.